17th November 2001 "The Scrumpy 'N' Western Show"
The Wurzels will be appearing at Calne Football Club, Bremhill View, Lickhill Road, Calne, Wilts supported by The Steve Raymond Band, Mike King and Eve Sherratt on Saturday 17th November. See www.entertainmentagent.co.uk/newshow.htm for more info. The Wurzels will be appearing at Waterside Holiday Park, Bowleeze Cove. The Wurzels will be appearing at The Village Hall, Earlswood, Nr. Chepstow, Gwent on Friday 14th September. Support acts will be Greg Suggitt & Ricky Ford. See www.entertainmentagent.co.uk for more info. The Wurzels will be appearing at Ye Bristol Inn, Clevedon on Wednesday 13th September. Doors open 8pm. Tickets £4 - a pound off if thee wear yer wellies! For more info contact Di or Steve on 01275 872073. 7th September 2001 'Arvest Ball at Norton St Phillip - a black tie Wurzels do! also Drink vodka from Daisy the cow!!!! To be held in a huge marquee in a field - "an excellent night guaranteed!" The Wurzels will be doing their annual summer season at Brean Leisure Park, Somerset. The shows will be in The Farmers' Tavern and RJ's Bar at Unity Farm. The Farmer's tavern at Brean Leisure Park can be contacted on 01278 751595 for info & bookings, or see the Brean Leisure Park website. The Wurzels will be appearing at the Dorset Steam Fair on Wednesday 29th August this year - see www.steam-fair.co.uk for more details. The Wurzels are performing with The Swinging Blue Jeans, The Fortunes and Marmalade on Monday 27 August 2001 at Simmons Park, Okehampton, Devon to help raise funds and boost the economy of the area after being devastated by Foot and Mouth. In the evening we have The English Symphony Orchestra performing Last Night of The Proms. Full Days entertainment, including catering, bar, fun and laughter, childrens entertainment and marquees with local crafts and produce. Day starts at 11am. A joint event of Y.M.C.A carnival club and the Centurion Carnival (thanks to Mandy for this info). Ta to Nick Carter for this additional info. The Wurzels are returning to McClusky's, The Pithay, All Saints Street, Bristol. £1 from every entrance ticket will be given to The Wurzels' Farming community fund. Tickets £5 in advance or £6 on the door. Open all day but tickets valid from 8pm. The Wurzels will be playing at the Guildford Festival again this year. For more details see the Guildford Festival website. Thanks to Nick for the info. The Wurzels will be promoting their new single at Tower Records, in the Sovereign Centre, Weston-super-Mare, at 12:30. Go down there and get'n to sign a copy of the single! 30th July 2001 Cowshed Remix Launch Down Broadmead! The Wurzels play the Cowshed Remix at The Podium, Broadmead, Bristol at 1pm, then they wll be signing copies of the new single in HMV from 2pm - get along there and buy a copy - help get the Wurzels back to Number One! Open air Concert on harbourside. Says Tommy: "Should be a real Wurzel Rave!" The Wurzels will be at the Welland 2001 Steam and Country Rally, Woodside Farm, Welland, Malvern, Worcs. Tel: 01531 890417 or 01531 890762. Admission to the rally, which includes the gig, is �5 (�3 for children and OAPs). Apart from The Wurzels, the rally is an excellent day out with plenty of vintage tractors, cars, lorries, etc., plus heavy horses and "all the usual stuff associated with such happenings"! Thanks to Gerry Spiers for the info on this 'un! The Wurzels are playing the Bristol Community Festival at Hengrove Park on Sunday 15th July on the Second Stage at 8.20pm. Thanks to Matt Guy and Kate Atwell for the info on this 'un! The Wurzels and The Plonkers are playing at the Shalbourne Country Fayre, Music and Ale Festival - not only great music but plen'ay o' different ales to drink while you'm listenin' to'n! See the Shalbourne Fayre Website for details. Thanks to Steve Gibbons for the info on this 'un! Also see the Mangel Rock Is Set For Comeback article in the Swindon Advertiser, first published Thursday 19th Jul 2001. 13th July 2001 THE WURZELS IN LONDON! To promote the new Cowshed Remix of Combine Harvester, the lads are doing a one-off Live Appearance at L'il Backyard Club, Fitz & Firkin, 240 Great Portland Street, London W1, at 1:30pm. Before that the band will be arriving in a Combine Harvester to get maximum publicity for the record and the farmers' charity. 1st July 2001 Two gigs in one day! Cassn't be bad, can'm! The Wurzels will be appearing at 2:40pm at the Keynsham Musical Festival, Memorial Park, Keynsham, 1-7pm, free. A day of events from processions to workshops, concerts to fireworks. The acts include The Wurzels (2:40pm), Free Spirit (folk-rock and ceilidh) (4.15pm) and the wonderful Fat Man Swings (6pm). Special message from ol' Pete Budd hisself, exclusive to Wurzelmania! 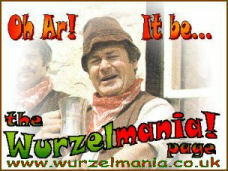 Says Pete: "Dig out thee wellies and scarves and get down to Keynsham and let's show the b*gg*rs what Wurzelmania! really is and put our mark back on the map!" Zider Ed was there - he says: "Crackin' gig, lads! 'Twere an 'ot zunnay day an' aw. Thick beer tent done good buziness, I reckons! Pitay the tent were too smaw fer they 'undreds o' folks try'na get in. Nice to meet up wi' Jules, Woody an' aw they - not fergettin' the lads theirselves! We 'ad a good time an' opes thees aw did too! Let The Zider Flow!" Sunday 1st July, 7pm. Tickets: �7.50 in advance or �8.50 on the door. See Frome Cheese Show Website for further details. Ta to Ed Hayes for the info. 16th June 2001 Private booking - Dean Stoner's wedding! The Wurzels are playing at the Bullingdon Arms in Oxford (01865 244516) on Friday 8th June. Doors open at 8pm, and tickets are £6 in advance. Thanks to Ed Hayes for the details. Katherine Selby had some pics on the Scrumpynet website, but sadly that website is no more! Not a proper gig, but memorable for being the first occasion The Wurzels performed the 2001 "Cowshed" Remix of Combine Harvester! Tommy & Pete were also interviewed by Gloria and took part in a cookery demonstration involving a gallon o' scrumpy. The show was recorded in the evening of 6th June for transmission on Channel 5 TV at 2:20pm, Monday 11th June 2001. Wurzologist Paul Gunningham went along to see the recording - see his review! Thursday 3rd May 2001 The Wurzels in K-E-Y-N-S-H-A-M! The Wurzels are playing at the Fry Club, Somerdale, Keynsham. Tickets priced £8, available from the club - ring 01179376500. Thanks to Jules for the info on this 'un! "The Wurzels played the Princes Hall and were supported by some Elvis impersonator (sorry, didn't catch his name). It was �8 and fewer than 100 turned up (maybe because of the lack of cider in the bar?). Songs included (in no order - my memory's crap): Drink Up Thy Zider, Twice Daily, Champion Dung Spreader, I Wish I Was Back On The Farm, Blackbird, I am a Cider Drinker, Combine Harvester, Pill Pill, Morning Glory. Songs that didn't play (to my disappointment) included 'Don't Tell I... ' and 'The Wurple-Diddle-I-Doo Song'" - Scrumpy Dziek - ta for the info. The Wurzels are playing at The Cooperage at the Barbican in Plymouth. For ticket prices (believed around 5 or 6 quid) and booking please ring 01752 229275. Thanks to Reene the Wurzet for the info. The Wurzels are playing at The Music Hall Theatre, Shrewsbury. Also on the bill are The Steve Raymond Band, Linds Rossi and West Country comedian Mike King. We'm told the show can be viewed on www.entertainmentagent.co.uk/newshow.htm and more info can be obtained from Clive Wilce. Ta to Shirley Wilce for the info. The Wurzels are playing at The Tramways Club, London Road, Gloucester. Also on the bill are The Steve Raymond Band, Linds Rossi and West Country comedian Mike King. We'm told the show can be viewed on www.entertainmentagent.co.uk/newshow.htm and more info can be obtained from Clive Wilce. Ta to Shirley Wilce for the info. The Wurzels are playing at The Phoenix Theatre in Exeter. Thanks to Jules for telling us about this event! The Wurzels are playing at The Thekla in Bristol city centre. More info: Tickets available for £7.50 on the door or £6.50 from Imperial Music (Park Street) or Backyard Records (Just off Baldwin Street). Support will be from The Oil Exports "who are hip-hoppy-trip-hoppy-ish. It should be a belter!" Thanks to Jules for telling us about this event and Beeser for the details! The Wurzels are playing at The Bells Golf Club, Colford in the Forest of Dean. Also on the bill are The Steve Raymond Band, Linds Rossi and comedian Mike King. For ticket prices and booking please ring 01594-832583. Thanks to Jeff Harris for the info. Friday 12th January 2001 See The Wurzels in 2001! The Wurzels will be appearing at McCluskey's, The Pithay, Bristol on Friday 12th January 2001.